Living in Ipswich as I do, and not driving, I find it easier to get into some parts of Norfolk than others, which is why the bulk of the churches remaining to be visited by the Norfolk Churches Site are on the western side of the county. Occasionally, and quite understandably, Rectors, churchwardens and members of congregations get impatient with this. Some of them are politer than others. Back in April, Peter Agate wrote to me: May we invite you to our beautiful village of Boughton and All Saints Church? It would be lovely to have our church added to your interesting and well presented website. Well, how could I refuse? David Striker and I headed up from Brandon on a late spring day which had started very wet, but which was beginning to blossom at last. Boughton is one of those pretty little villages which cluster about the rather more agro-industrial larger village of Stoke Ferry in south-west Norfolk. Like the other two, Wereham and Wretton, Boughton has cottages around a lovely village green and a pond. Sam Mortlock thinks that Boughton's pond is the best of all in Norfolk, and I was inclined to agree. 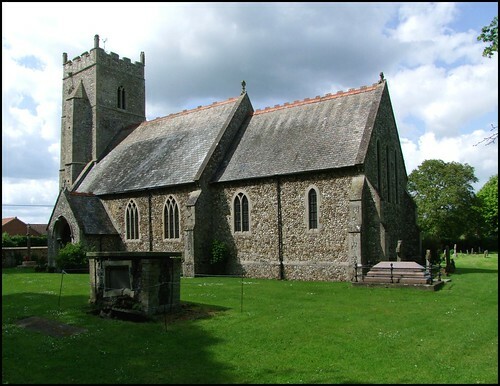 All Saints church is typical of hundreds of small English churches which have got on with the business of being the spiritual touchstones of their parishes for hundreds and hundreds of years. There is no Big House here, no Big Family to keep their firm hand on the tiller, and so the building has been carried gently through the centuries by local people, touched lightly on a fairly regular basis, and occasionally radically restructured when theological enthusiasm or iconoclasm intervened. Thus, we have a building which is almost all of its 1872 restoration, which was essentially a rebuilding. But the tower survives from Catholic days, and seems to have been only lightly restored by the Victorians. Unlike the churches at Wretton and Wereham, we found this church locked. There is a keyholder notice, although it must be said that the kind lady who came to open up seemed rather surprised that anyone should want to see inside. It is true, there is nothing remarkable here, but it is really impossible to get a true flavour of a village without seeing inside its parish church. Conversely, if a parish keeps its church locked without a keyholder notice, it tells you an awful lot about that village. And, in fact, there is one thing of great interest. This is a small window in the nave depicting Christ as the Good Shepherd and the Light of the World in a bold and yet contemplative style, which I found difficult to date. It seems too late for the date of the restoration, and yet it has no memorial inscription, and no maker's mark as far as I could see. Perhaps it may be from the early 20th Century? The nice lady, reasoning by now that David and I were relatively harmless, wondered if we would like to go up the tower and see the view. Now, I have a terrible fear of heights, but I always accept these offers on the grounds that it might one day cure me (I once described this hope on these pages as 'kill or cure', but realised quickly that this was not what I meant at all). If I had known how precarious the bell floors and ladders were I might have turned her down, but by the time I had decided that I definitely wasn't safe I was already out in the open, up on the top. The wind blew straight out of Cambridgeshire, and I clung on to the lightning rod for fear of being cast over the low parapet. Fine views, but not much of interest in the way of landmarks, apart from the sugar beet factory at Wissington. And then, the same hideous journey back down to safety.